​"Because we strive to be effective teachers, we must first be effective designers"
"Backward Design is goal directed. We aim for specific results and design backward from them accordingly"
​The first stage of Backward Design is to identify what the student should be able to do, know, and understand upon completing the learning. This will depend upon content standards, course objectives, and desired learning outcomes. "We cannot say how to teach for understanding or which activities to employ until we identify which understandings we are after and what these understandings look like in practice. Only by identifying the chosen results can we focus on the content, methods, and activities most likely to achieve these results." ​If your school or district uses the Common Core State Standards (CCSS) or another set of national or institutional curriculum standards, then your task is to develop lessons that successfully address the standards and assess student attainment. First, the standards must be "unpacked" into their components in order to clearly state the learning objectives. CLICK HERE for instructions on how to unpack a standard. North Carolina’s educators have unpacked each of the (CCSS) standards already. To utilize those resources, CLICK HERE and find your standards area. If your state or school does not implement CCSS, you may have access to the standards that are used and their various strands, sub-strands, and/or benchmarks. 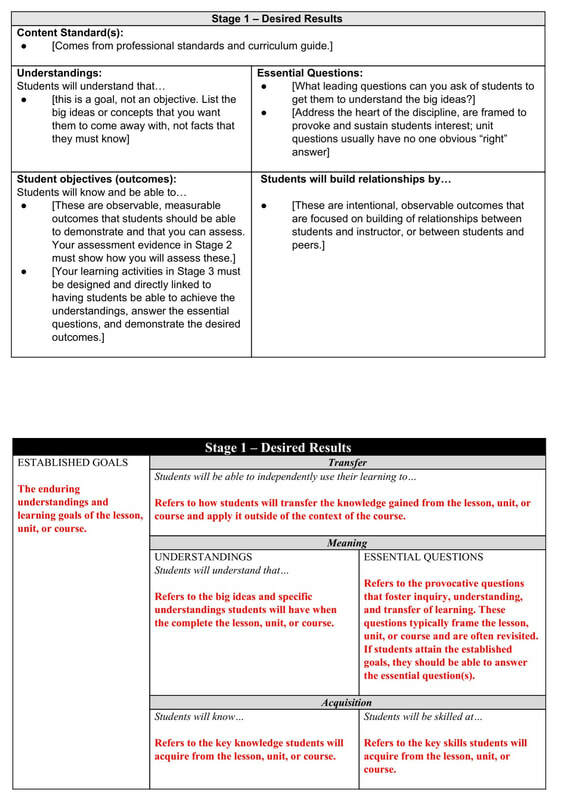 ​Once identified and unpacked, these standards will become the "Learning Goals" which require scaffolding the necessary "Knowledge and Skills" (Learning Objectives) to create the desired "Understandings" (See the Lesson Plan Template below). The Final Report of the NC State Board of Education's Task Force on Global Education explains their findings on what is necessary to "produce globally competitive graduates ready to live, work, and contribute in an interconnected world." What have been termed "21st Century Fluencies", are increasingly recognized as important standards to include in every course and curriculum. More information can be found at p21.org. In addition, there are many "College and Career Readiness Skills" which have been identified and organized, and should be included in any well-rounded curriculum to prepare students for the real world. 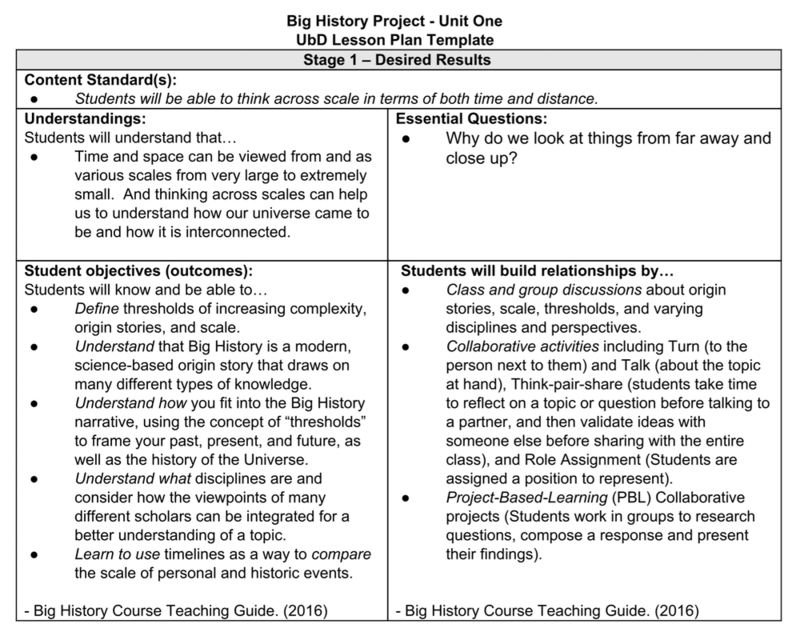 Examples of these readiness skills, for an example curriculum "The Big History Project" course, along with the associated standards, learning objectives, and "Essential Questions" to frame the learning for that course around, can be found in an​ infographic below the Stage One Planning Template Examples. "a genuine understanding involves another kind of transfer. We go beyond what we see, using big ideas, to make meaning of it." ​"MEANING-MAKING OCCURS WHEN LEARNERS ARE GIVEN THE OPPORTUNITY TO CONSTRUCT THEIR OWN UNDERSTANDING AROUND BIG IDEAS AND ESSENTIAL QUESTIONS." Understanding is about making connections and binding together our knowledge into something that makes sense. "To have understanding means that we show evidence of being able to transfer what we know." (Wiggins & McTighe, 2006). In order to focus on the "big ideas" that give meaning and connection to all the learned facts and skills, we can use essential questions to guide student inquiry and focus instruction. These are big overarching questions, centered on the standards and goals of understanding, that should be pursued and contemplated throughout the unit, course, or curriculum to help tie together all of the activities and learning in the learners mind. They should be standards based. Cause genuine and relevant inquiry into the big ideas and core content. Provoke deep thought, lively discussion, sustained inquiry, and new understanding as well as more questions. Stimulate vital, ongoing rethinking of big ideas, assumptions, or prior lessons. Spark meaningful connections with prior learning and personal experiences. Naturally recur, creating opportunities for transfer to other situations and subjects. Click Here for checklists from the Santa Ana Unified School District to help you assess whether or not you have created good essential questions see the lists on their Godinez Fundamental High School Website. The term “understanding” is such a complex idea that Wiggins and McTighe have delineated six facets of understanding as shown in this chart (2006). They describe understanding as the ability to explain, interpret, apply, have perspective, empathize and have self-knowledge of a concept. 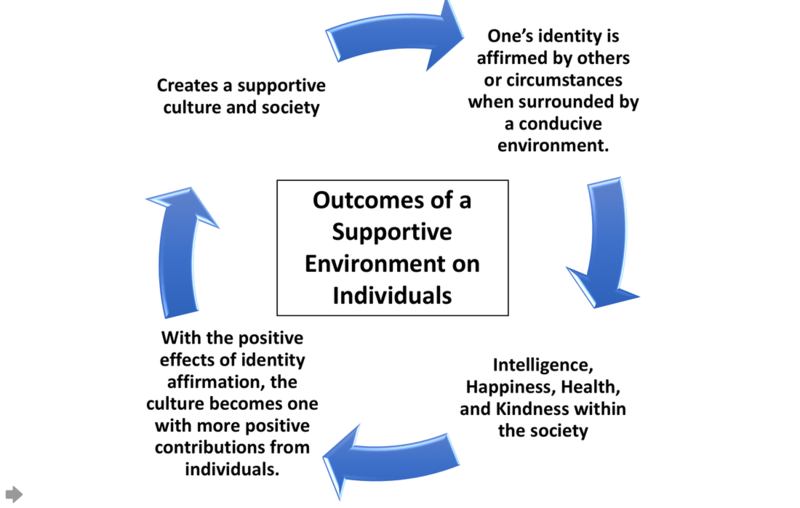 Click Here for a summary of the Six Facets. In order to develop real understanding, motivation is key. Essential questions can help motivate students by "connecting abstract learning to concrete situations", and allowing them to "Go deep into the subject." Watch the video below for insight into real motivation and then read the suggestions that follow. A very important element of motivation as elucidated by Pink (2010) is "Purpose"; a sense of meaning for the task, job, or lesson. People want to feel like they are contributing to something bigger, like the work they do has relevance. One way to ensure that students have that sense of purpose in their studies is to always frame each lesson and unit into the real context in which that knowledge or understanding lives; be it the relevant career, societal function, even philosophical understanding or practical everyday life applications that follow. A great tool to use in providing that context while at the same time creating a challenge is an essential question. The right question can create a framework within which to explore the many ideas and perspectives that human knowledge and understanding is built upon. We can think of it like planting a seed. We cannot make someone interested in a subject or topic, the key is giving them that question, that seed of mystery... and letting them grow the tree of understanding from which will follow the fruit of intrinsic motivation. Start with the question, not the answer. Encourage students to beat their personal best. Connect abstract learning to concrete situations. Go deep into a subject. ​According to the work done by Hattie (2009) and others, relationships between students and teachers as well as between students and their peers, have a large impact on the effectiveness of instruction. Therefore, it is important to identify opportunities amongst the course goals for collaboration and relationship building. Different schools or courses may require more focus on certain aspects of the first stage of Backward Design. One of the example templates above has a section to describe how the students will "transfer" their understandings and apply the learning outside of the context of the course. Whatever your particular curricular needs may be, it is suggested that "Designers should work smarter, not harder, by sharing curriculum designs with others" (Wiggins & McTighe, 2006). Continue to Stage Two for information about Adding Assessments to determine if the Goals have been met.